Set of productivity tools for Autodesk® Revit® 2017. Contains tools like job-time tracker, reference list, compound structure annotation, room floors, dimensioning tools, left/right door opening schedules, room renumbering, duct renumbering, duct splitting, export schedule to Excel, create anaglyph image from 3D view, change text to upper, lower or title case and replace by using regular expression and create legend of selected doors, windows etc. and their selected parameters; extended filter for element selection, wall-pipe dimensions, export/import of schedules (bidirectional), mass join geometry, door swings in curtain walls, sheet scales, sheet formats, type legend and direct access to thousands of RFA families. Online tools for accessing RFA families. Compatible with Autodesk® Revit® 2017. Trial version is limited for 15 days of using and have some small limitation in function. Good enhancements for Revit. Recommended. 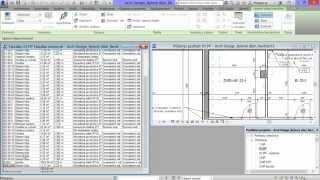 Lots of very good tools to enhance and automate Revit functionality. Schedules, annotation, sheets, families. Lots of useful functions, works fast, without any problems. I like the annotation tools. A broad set of tools. In Czech and English.